We aimed for the design to be futuristic, aesthetic, and original, both in the exterior as in the interior. The chosen vehicle design combines the industrial and the sensual, the hard and the soft, a sculptural marriage of opposites in an iconic timeless design. 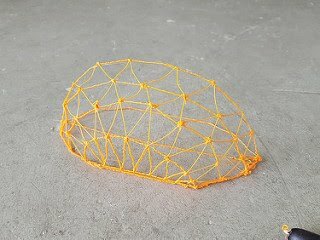 A cold multi-faceted shell hosting a warm protective cocoon. Performance and strength on the outside, pleasure and freedom on the inside is our vision of the future of mobility. 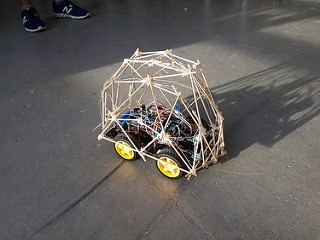 Using the four-wheeled Arduino-based robotic car as the model vehicle, a scaled version of the dome was built using wooden sticks and plastic panels. Should the chassis be shortened? Should the seat frames be removed? What would be the simplest and most efficient configuration? Which parts of the chassis should be kept and what kind of structure could accommodate handicapped users? 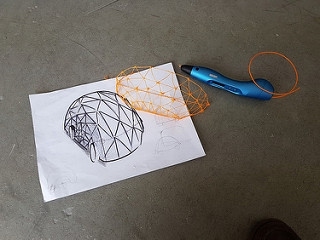 Table below comparing the different methods of fabricating the dome. Testing to see what sized triangles give the best view/ transparency from the driver's perspective (using steel and transparent tape). Table comparing the different sized triangles and ranking them against each other. Table below showing the results after investigating the effects of using different methods of combining the pieces of acrylic together.